Flux is a chair made from a single injection moulded sheet of polypropylene with curved fold-lines and integrated assembly notches. It turns from an envelope-shaped package with a built-in handle into a modern and stylish chair and back again in seconds. The advantages are obvious: easy to store, easy to clean and care for, light weight and durable, even outdoors. 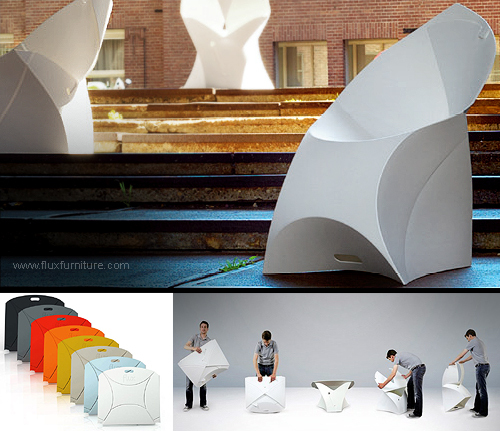 Available in eight colours, the chair has seating pads in four different colours to combine with. Flux Junior is an identical, mini version for the kids.